Welcome to the first Mad Level Manager tutorial. It explains how to create your first level select screen with the most basic configuration possible. This is the only small part of what Mad Level Manager can actually do. If you want to know more, please read the overview page or look at the other documentation pages. 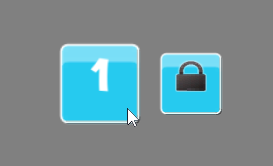 …and then select the Level Configuration option. The New Configuration asset will be created. Let’s rename it to “My First Level Configuration”. Now look at your Inspector view. You should see that there’s one important error that should be immediately fixed. This message means that the Level Configuration asset that we’ve created just now must be located under the declared directory. 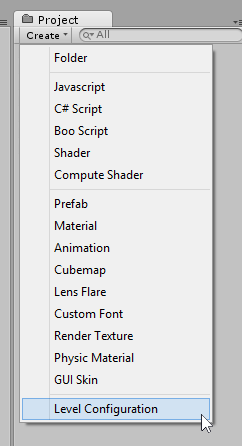 That’s because Unity3D treats differently everything that lies in the Resources directory. If you’re still seeing this error after creating the directory structure, please make sure that there’s no typo in your directory structure. Letter case matters! 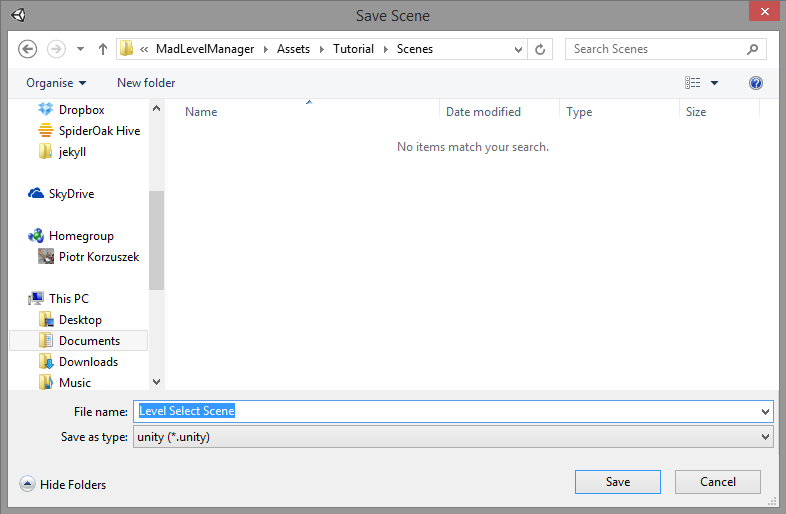 …in new Tutorial/Scenes directory as Level Select Scene. 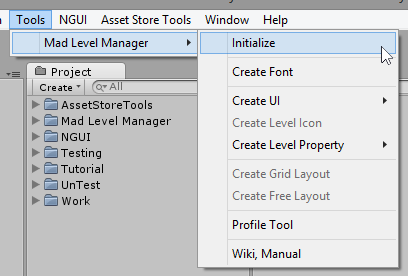 Make sure that you have My First Level Configuration selected and take a look at the Inspector. On the top you can see that this newly created configuration is not currently active. This means that it won’t be used to manage your level work flow at the current state. Let’s make it active by clicking Activate This One (1). You can have multiple level configurations in your project but only one should be active at the moment. Creating multiple configurations may help you to build demo and full versions of your game. See three exclamation marks next to New Level on the list? This means that this level configuration is invalid and your attention is needed. It is a common thing because we’ve just created this level hence it needs some initial setup. 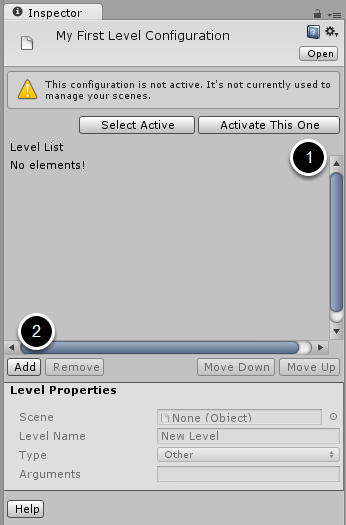 Scene – here you should place your Level Select Scene that we’ve created earlier. 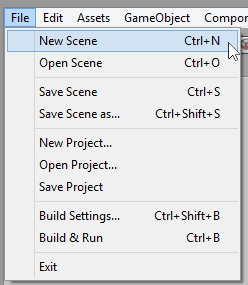 This is a place for a scene object. 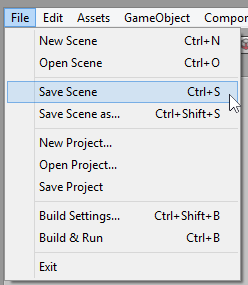 Just drag & drop your scene here. 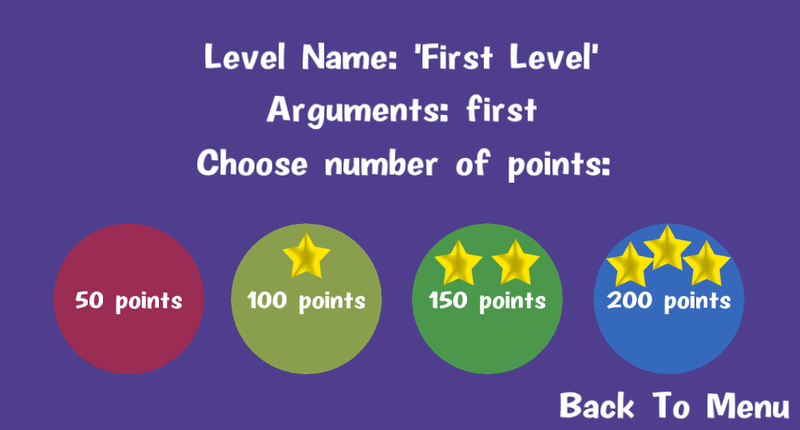 Level Name – name your level “Level Select”, so you can easily refer to it later. Type – set the type of your level. 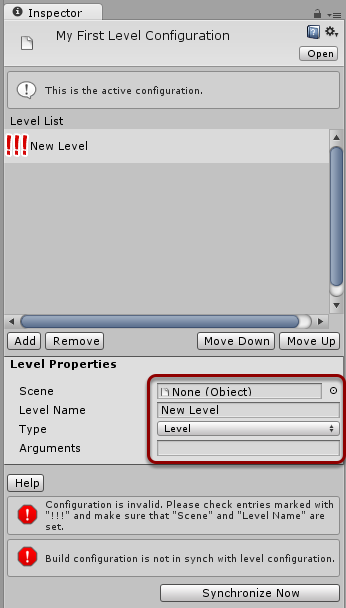 All levels that are not actual game levels should be set to Other. Arguments – if you want to pass arguments to your level (and read them later), you can do it here. We will leave this one empty. Arguments can be read anytime by accessing MadLevel.arguments. This property will always contain the string set in the level configuration. Have you noticed that some errors are gone? Don’t worry about the synchronization error. This means that something in the level configuration has changed and the synchronization procedure is necessary to make everything work as expected. Unless we don’t finish our configuration we won’t need to synchronize it, because it will simply pop-up again. Now we will create two playable levels. 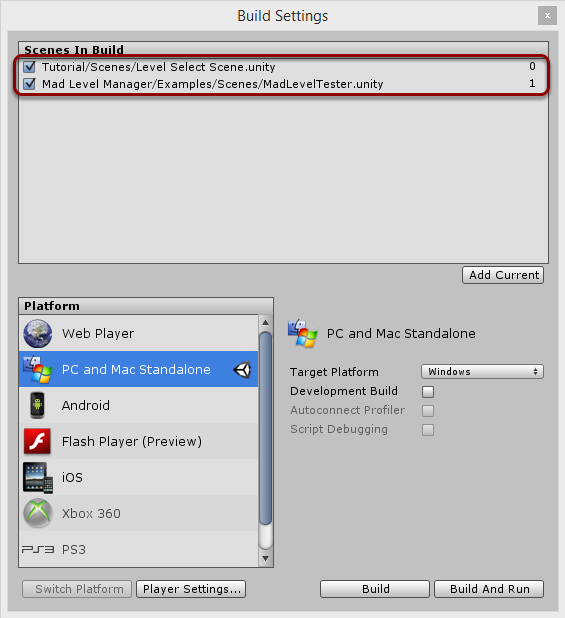 As a scene we will use MadLevelTester that is placed in Mad Level Manager/Examples/Scenes. This scene imitates a playable level and allows you to proceed to the next one and return to level select screen. 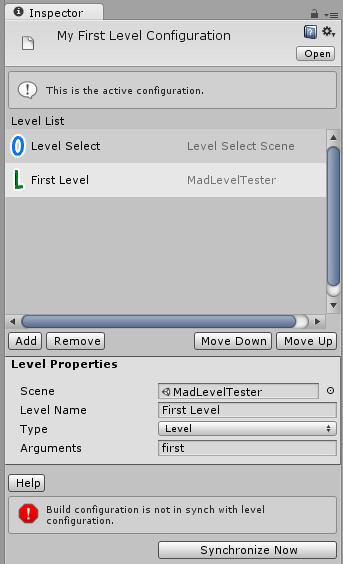 MadLevelTester allows you to return to level select screen only if this level name is equal to Level Select. If you name your level select screen differently and then want to use the tester scene, you will simply receive an error about missing Level Select level. We’re setting arguments here just to make a proof that it can be read. MadLevelTester will display the read arguments on its screen. Note that First Level and Second Level are using the same scene. This is a common thing when working with Mad Level Manager. You can use one scene to represent many levels, and use an argument line to pass information about which data file should be loaded. Of course this is only up to you (or programmer in your team). You can take a peek at what it did to your build configuration (File → Build Settings or Ctrl + Shift + B). 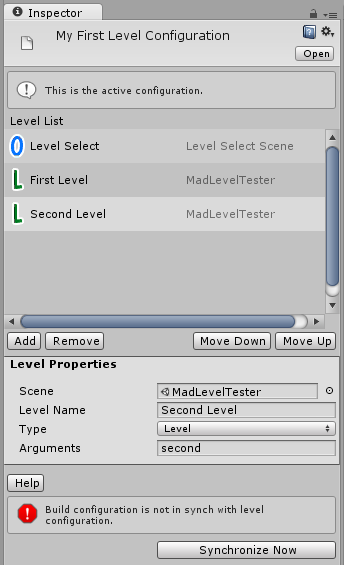 Level Select Scene will be launched first, and MadLevelTester is placed as a second scene in the build. 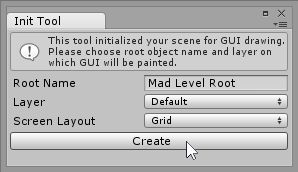 Next, from the main menu select Tool → Mad Level Manager → Initialize. 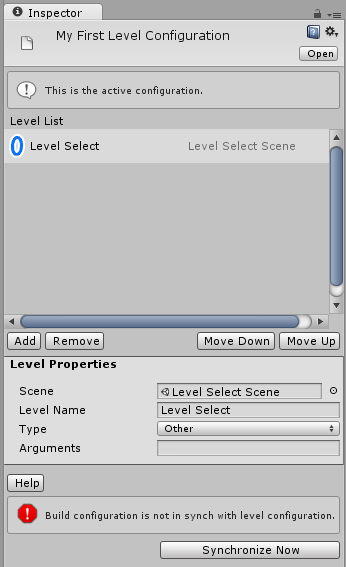 Then select the first level in your Game view. The First Level with the argument first will be loaded. Now you can try to assign stars, so go back to the level select screen, and play with Profile Tool. This concludes this tutorial. 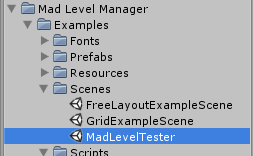 Be aware that what you’ve learned here is just a small portion of what you can do with Mad Level Manager. Please look at the other documentation pages to discover how to customize the look of your level select screen, and how Mad Level Manager can help you manage your levels and game progress!